Are You Attending ATD 2016? 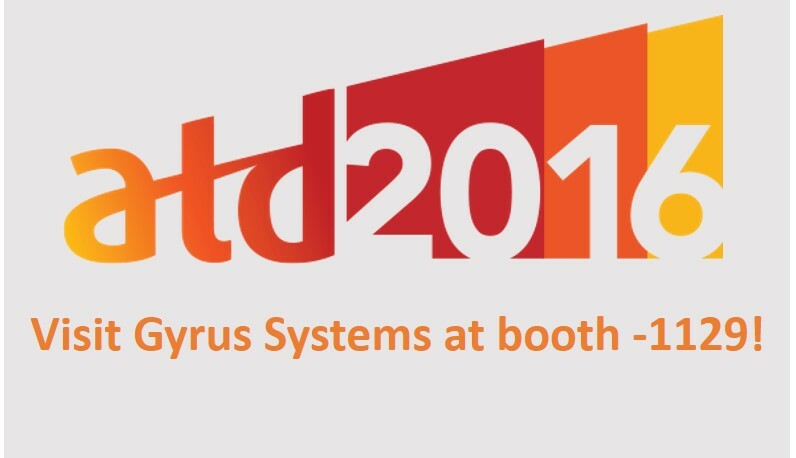 Gyrus Systems Team is all set for ATD 2016! We are eagerly looking forward to Association for Talent Development (ATD) 2016 International Conference & Exposition taking place on May 22-25 in Denver, Colorado. Our team will be present at booth #1129 to talk to you about your learning and training challenges and explain how our LMS - GyrusAim can help you overcome these. Schedule a Live Demo: Don’t miss a chance to get a live demo of GyrusAim from our team of experts. You will get to see the latest version of our award-winning LMS-GyrusAim. Make your appointment ASAP by sending an email to sales@Gyrus.com using the subject line “ATD 2016″. Out team will be all set and prepared beforehand to show you the demo at your preferred time and day. Request for a Demo at the Booth Itself: We will be more than happy to accommodate your request if you have not been able to get your demo slot pre-booked. Just visit us at booth #1129 and talk to our team about your training requirements and challenges. We will show you what exactly GyrusAim can do for you. Drop Your Card at the Booth: We understand some of you might not be present on all four days and you may not manage everything you intend to do due to time constraints. Do not worry. If you are interested in hearing more from us or schedule a demo for a later date, just drop your card at the booth. Our team will get in touch with you right after the event ends. You can also connect with us on our social media channels. Give us a mention on Twitter @GyrusSystems with #ATD2016 and we will connect with you right away.